Alma has given Tops a radical haircut for the summer; she even used electric clippers. We haven’t seen Topsy’s eyes since she was a puppy. You aren’t supposed to do this, according to the racial purity laws of the Irish Soft-Coated Wheaten Terrier Owners League, or whatever they’re called. Alma says the fur will have to grow out again before Topsy can take part in a dog show. Why is that important? Because unless she’s won a prize at a dog show, we the owners can’t sell or give away any puppies she has; if we were to try to do so the breeder we got her from could demand her return. Why didn’t we get a mongrel? Well, I’m allergic to most dog fur; I can only live with Wheatens and Labradoodles and that lot (and Alex, apparently). The funny thing is they have such strong, rigorous opinions about dog aesthetics, but you should see the judges themselves; the men all look like Terry-Thomas and the women like Margaret Rutherford. Kennel Clubs have none of your sense of genuine concern for the animals they breed. How else is it possible that a breed (English Bulldogs) can be so distorted that natural births are impossible and caesarians are required? A Scotish author of crime fiction wrote a lot about springer spaniels and mentioned that there are two distinct types now – show springers, pretty and spectacularly stupid through inbreeding, and gun springers, actually capable of thinking. Having grown up with a show springer his words made much sense to me. I am trying to maintain the positive tone you set so I shall simply say that the sort of extreme eugenics Kennel Clubs promote is as repugnant when practiced on dogs as it is when practiced on humans. She looks stunning and very comfortable. Excellent work, Alma. There was a dog in there?! 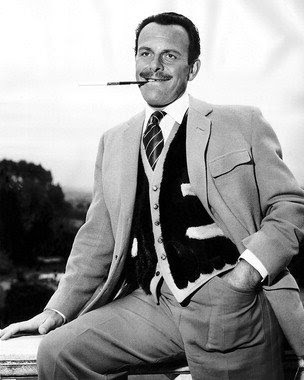 I don’t know who Terry Thomas is, but I rather like the look. Pity about the allergies. I think I should be glad to have grown up in the dirt. Adorable either way, but I prefer the long-haired look. Kind of 1960s hippie. Now she looks a bit like the canine equivalent of a corporate raider. Very buttoned up, clean shaven. Eating companies for breakfast. You’re right she does look a bit like a corporate raider. With very expressive eyes, ‘Pleeease give me your company’. It’s even worse than brushing their fur straight. It’s fur hedges: poodles clipped to look like sailing boats, terriers trimmed to appear more muscular — as if body builders disguised their real form with bushy chest-hair. God, how I love Wodehouse. My late (Norwegian) father-in-law had those white Scottish eyebrows and dark brown eyes — a tall, very good-looking man. But I once put up on the screen a portrait photograph of him next to one of Topsy. They were twins. Now her eyebrows are too short to look Scottish. You’re right, Mr Crown. Her eyes don’t look shark-like enough for a corporate raider. Maybe a young Republican whose parents made her join? She is thinking wistfully about her long tresses. I hate the poodle clips. They look obscene. Thanks for the ‘dog judge’ photos, Crown. They have reinforced my appreciation for the Guest mockumentary “Best in Show”.